A couple of weeks ago, I got an invitation to the soft opening of the Charleston Harbor Fish House. My sweet friends Anita and Shannon work for the Charleston Harbor Resort, and we have been anticipating the opening of this restaurant with delight. As luck would have it, my mom was in town, and was available to be my date for the soft opening. We took the water taxi from the Aquarium, which is a treat in and of itself. If you visit Charleston, or even if you live here, you should take the water taxi. It is an excellent way to see the harbor and the city from a different angle. The new restaurant is open and spacious with lots of windows and clean lines. There were so many things on the menu that we wanted, but we settled on the hog snapper and the beef tenderloin. We also had hush puppies for a starter and a side of collard greens for fun. Everything was fantastic, the service, the presentation, the food, the view, and the company. After dinner, we went upstairs to the rooftop bar to watch the sunset. If you get the chance, head on over to the Charleston Harbor Fish Camp. Go like them on Facebook. Call me when you go, and I’ll meet you there. Happy Summertime! Let’s get real. 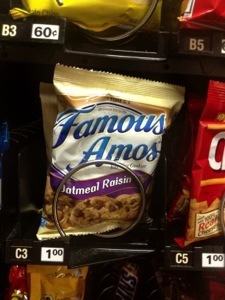 No one wants the oatmeal raisin famous Amos cookies in any circumstance, much less when they are seeking satisfaction from a vending machine. This is like when instead of peanut m&ms, they have those gross crunchy m&ms. I’m sitting on a patch of grass, on the edge of the parking lot of my office building. My building is one of many neighboring office buildings, and my friends work nearby. Paul works directly across the street, Dan works around the bend in the road, and Friend organizes food trucks to come visit. It might not be a glamorous area of town, and my building might be the plainest vanilla box you’ll ever see, but it takes me 15 at most to get here every morning, and there is plenty of free parking. I took off my long sleeve shirt and am sitting in the sun in a tank top. Of note, this would have probably (or definitely) gotten me fired from last job. It is 70 degrees, bright blue sky, and I’m eating roasted red pepper hummus and carrots. A few of my coworkers are walking laps around the complex for exercise. The interstate is buzzing along behind me, and although that could be an annoyance, I’ve gotten rather fond of the noise. At my last job, I was only allowed 30 minutes for lunch, on a good day. It is hard to drive to Wendy’s and back in 30 minutes. The job before that, my bosses liked to discuss cases at lunch, and lunchtime was not my own time, and the places we ate would have put me to sleep for the rest of the day if I’d actually eaten it. Work lunches were simply part of the job, and I think that is reasonable in certain professions like small law firms. I did lose ten pounds in the 18 months I worked there, as a side note. Having control over my own lunch is an amazing privilege that I try to never take for granted. I go to lunch whenever I want between 11-2, and I live in a place where the weather often lends itself to sitting in the sunshine. My coworkers like to pick on me because I eat a turkey melt on an English muffin every day. But it is a privilege, and I am going to enjoy it, because it makes me happy. For the most part, I believe America to be the greatest place in the world. We definitely have our own problems, and there definitely parts of America that hold no interest for me as place of permanent dwelling, but as a whole, America is pretty great. More specifically, the South East is pretty awesome. I love the weather, the food, the people, the flowers, and the way we talk around here. But today, I wish I lived somewhere else. I wish I lived in India today. Or, tonight, although I guess it is already night in India by now. I would really like to see the lunar eclipse tonight. I should have planned my vacations better. Apparently there is a chance I’ll get to see full lunar eclipse in America in April 2014, fingers crossed. Have I told you how Briscoe hates skateboarders? It might be one of the funnier things I’ve seen in a while. I think it is the noise that scares her. The dog needs a haircut like whoa. She’s going to get her hair did tomorrow, and I expect to have a little lamb by tomorrow night instead of the bear that is currently sleeping in my kitchen. For some reason she has developed this ridiculous habit of spilling her food all over the floor. It is like she picks up her bowl with her teeth and dumps it out, although I’m not sure that is actually possible. But once the food it on the ground, she won’t eat it. For a while, when I would come home to her spilled food, I would pick all the pieces up and put them back in the bowl. Then I realized, wait, she’s a dog, if she wants to spill her food on the floor, she should eat the food off the flood. So, I stopped cleaning it up, other than to turn the bowl back upright. Sure enough, after leaving the food on the ground until late into the night, the dog finally decided she would eat it off the floor. So, she’s started cleaning up the mess herself, but she’s still spilling the food. Something about summertime makes me want to lose myself in a story, preferably a long drawn out saga. Happily, HBO has provided that for me with The Game of Thrones, and even more happily, I am able to read the novels instead of waiting to see what happens in HBO time (which is painfully slow in my opinion). I enjoy the story, the show (and the novels for that matter) are quite gruesome and violent. I find reading about violent and gruesome things is easier than watching them play out on my unnecessarily large television. But I’m totally engrossed in the novels, each chapter is told from a different character’s point of view, and the author has mastered the ability to speak in each character’s voice in a way that is seemless but also adds a depth to the writing and storyline that is not immediately apparent. I would not recommend the books or the television series to everyone, there is a base element to it that not all will find endearing, crass talk of sexual encounters and horrible things happen to almost all of the characters. But even the villainous characters have redeeming qualities (well, some of them do) and the heros have flaws, and there is nothing I love more than a good story with round characters. I spent the last two weeks of May in Washington, D.C., training for work. Let me tell you, two weeks is a LONG TIME to be in a hotel. I learned a lot, got to spend time with some old friends (sadly, the Bizzy was out of town the entire time I was there), and enjoyed some fabulous food and beautiful sights, but I was very happy to come home to my apartment and my dog. I did meet some super cool new friends though. 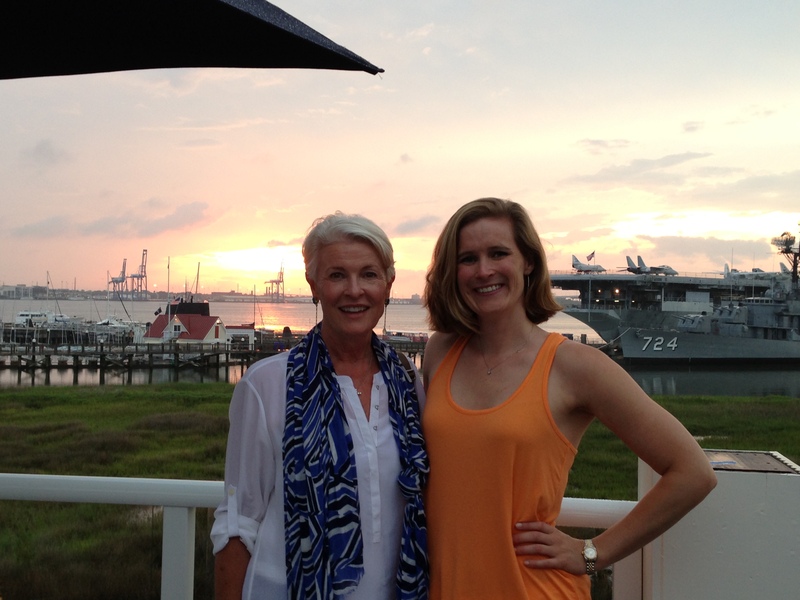 My mom and my aunt Jan came to visit me in Charleston this past weekend, and boy did we have a good time. I wish I could tell you we did lots of productive things, but really more than anything, we simply enjoyed Charleston and each other. We wandered, we enjoyed drinks on the rooftop under the shade with a breeze, we ate phenomenal food, (as a side note, a merinague will always add to a dessert), we peered through hedges, gates and walls into the fabulous gardens and side yards of people we didn’t know but wish we did, we sweated, we watched little children play in fountains, and Kate and Jan rearranged the furniture in my apartment. We did not shop at all, other than a short trip to the grocery, and we spent most of our time outside. It was great. Oh! So I want y’all to check out my cousin Heather’s blog – she has MS, and has an amazingly honest and refreshing perspective, including my favorite – Wheelchair Etiquette. Even if it was six days late. And it might be the only Birthday Fax I’ve ever received. David found it in the machine and was like – what the F is this? Sarah told him it didn’t have his name on it so it obviously wasn’t for him. It had a cover sheet and everything, but I left that off to protect the innocent. Oh, Mean Bean. I miss you. So I’ve told y’all about Donald, my handy-man. He has single handedly remodeled my house for me. Donald was installing some light fixtures for me the other day, and he was telling me about how he had to go home and baby sit his aunt. Apparently she’s real old and doesn’t know what is going on very well anymore (Donald’s words were a little less PC).